Courtesy of Santa Barbara Channel Swimming Association, Channel Islands, California. Starting on September 26th, Dan Simonelli completed an unprecedented Santa Barbara Island Hopper Swim. He started his stage swim with a 5.8 km crossing from San Miguel Island to Santa Rosa Island in 2 hours 30 minutes, then he swam a 9.7 km leg from Santa Rosa Island to Santa Cruz Island in 4 hours 5 minutes 30 seconds, then he finished a 9 km inter-island swim from Santa Cruz Island to Anacapa Island in 2 hours 15 minutes 9 seconds as September 27th rolled in. Simonelli and the others will be honored at the annual Santa Barbara Channel Swimming Association banquet tonight in San Pedro, California. 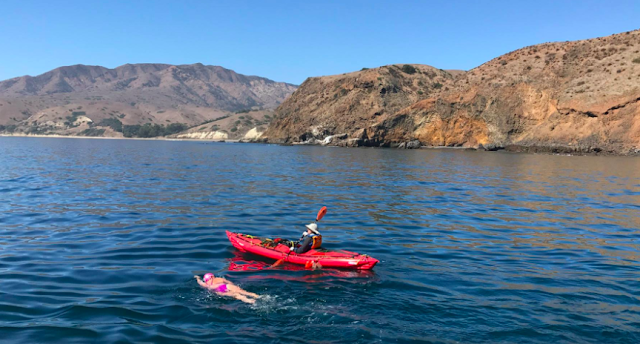 "We will celebrate this year's Santa Barbara Channel swims - or more precisely, any swim to, from, between, or around any of the 8 California Channel Islands, excluding swims between Catalina Island and the mainland, and swims around Catalina Island," says Evan Morrison. 13 solo channel swims and 4 relays were sanctioned during the 2017 season with 13 successes including Selkie & the Sirens, a 54-mile relay circumnavigation of Santa Cruz Island that took the team 39 hours 58 minutes (Louise Darlington is shown above with Michelle Premeaux McConica, Claudia Rose, Carol-lynn Swol, Diana Corbin and Jeannie Zappe).